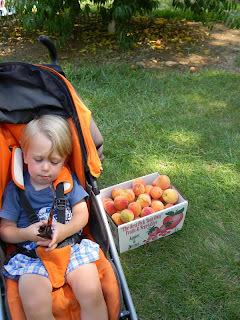 Peach picking and a hay ride were some of the many things we did on our traveling vacation last week. For as many times as I've been to Linvilla Orchards out in Delaware County, PA, and for all the farms we visited in the past week, I've never picked my own fruit out of an orchard. It's always been something I wanted to do and said I'd get around to doing, until the season passed and it would become something to do "next year." Finally, Next Year arrived as did the season for Peaches. While were up in Warren County, New Jersey, visiting with our friend Lynnette and her kids, Gracie and Timmy, we had a play date trip to Alstead Farms. First up on the visit to the farm was a hay ride pulled by a huge tractor while we all piled into a huge wagon loaded with hay bales for seats. It took us through the fields, past the berries, apples, tomatoes and into the peach orchards. Once into the orchards we couldn't stop ourselves from picking peaches fast enough. They were perfectly ripe and ready for eating. Gracie and Timmy stopped picking peaches long enough for me to take a photo of them and our bounty. Nate enjoyed running through the orchards as well running into the tractor ruts and out onto the farm road. We had to wrangle him back to his stroller, giving him a time-out and a beverage to rehydrate him from his work-out. We didn't want to be accused of using child labor in the fields. We picked a lot of peaches and they were rather expensive but...we had a lot of fun being outside, playing, running and being together. With all the peaches we had it gave us a lot of produce to make peach salsa and cobbler. Since the farm also had a store, I could purchase all the ingredients to make a fresh peach salsa. Nearly every ingredient, except for the lime, was grown on the farm and was literally a farm to fork (or in this case, bowl to chip) dish. Use a large mixing bowl and clean, seed and dice all the vegetables as indicated adding each diced vegetable and fruit to the mixing bowl as you cut them - the tomatoes through the garlic clove. Add in finely grated lime zest and juice, the tablespoon of vinegar and cilantro, tossing to combine. Season to taste with a pinch of salt and a few grinds of black pepper. Refrigerate for about an hour before serving for best taste and to allow the flavors to meld together. Salsa will hold for up to 3 days in a tightly covered container in the refrigerator. This recipe is so easy, fresh and fast and can be made as hot or mild as you like. It can also be made into a fire roasted version - whereby you grill all the ingredients and then chop them to make the salsa. It can also be cooked and canned, to be enjoyed for future use in the winter. For canning tips, see my salsa canning entry from several summers ago here. If you make a large batch of the salsa and you don't want to can it - you can cook the salsa instead of serving it raw/fresh. Make the salsa according to the directions and then add the finished product to a 3 or 4 quart sauce pot. Bring the mixture to a boil, reduce heat and cook for 15 to 20 minutes, keeping the salsa at a low simmer. Cool the salsa and taste and adjust the seasonings - vinegar, lime juice and salt and pepper as needed. The cooked salsa will hold for up to 1 week. The salsa can also be turned into a gazpacho. Puree all but a quarter of the salsa in a food processor or blender, until the mixture is thoroughly pureed but not perfectly smooth. Add back some of the reserved salsa to the puree and serve cold, immediately. The gazpacho will hold for up to 2 days. The Bicycle Chef's Food Photography Portfolio!